We took a family outing to Luray Caverns in Luray, VA, about 90 miles from Washington, DC. Neither Kenny nor I had been before and we thought, in light of the recent cold snap, it would be a good "indoor" activity, considering the caves are a balmy 54 degrees year round. We enjoyed our visit and being outdoors without also being exposed to the elements. It's not that far from DC and definitely worth the trip, at least once anyway. An almost perfect family group shot, apart from Isaac not looking and the photo being slightly out of focus. But, we'll take what we can get. Kind of a creepy looking rock formation. The black is the result of manganese. There were also white formations that get their color from calcium deposits. In general, the rock was much more colorful than I anticipated. This was really spectacular. The picture doesn't do it justice, but the pool of water reflects the ceiling and makes it look like a 20 foot deep cavern. The water is only about 6 inches deep and crystal clear. The caves were first discovered in 1878, and boast many different types of rock formations. The tour is only 1.25 miles, but there is plenty to ooh and aah over. At one point, I looked up and this was directly overhead. The folds are so delicate, it is hard to believe this is rock. This organ is located in the part of the caves known as "The Cathedral." They have actually had over 400 weddings in the caverns. The Great Stalacpipe Organ -- we heard a demonstration of this instrument which, instead of using pipes to produce sound, is connected to a series of stalactites throughout the caves. The stalactites have been sawed off at the appropriate lengths to achieve the correct tone. Obviously, this organ was installed long before conservationists were sufficiently mobilized to intervene. See the wires? Those are connected back to the organ and when the corresponding note is played, the stalactite is hit with a mallet and the note fills the chamber. It's really incredible. The wishing well. Our kids wished for Santa to bring them lots of presents. 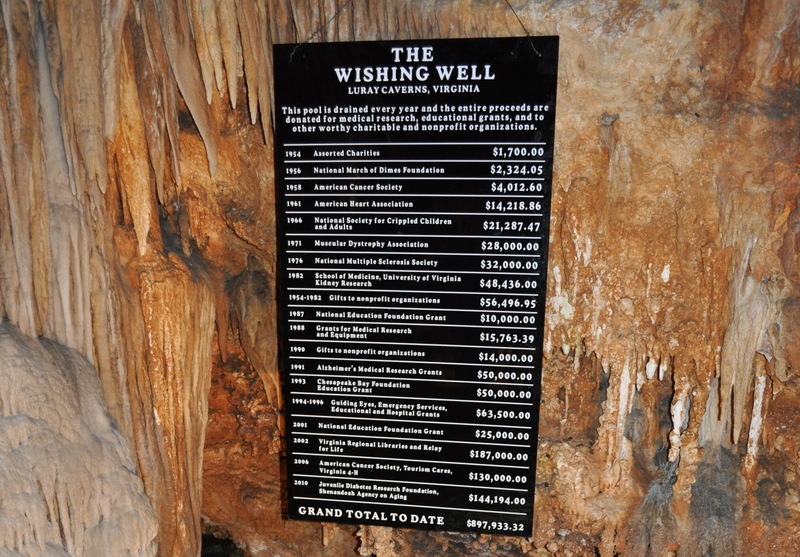 I'll try to do a better job of schooling them in the mystique of wishing wells before we visit another one. 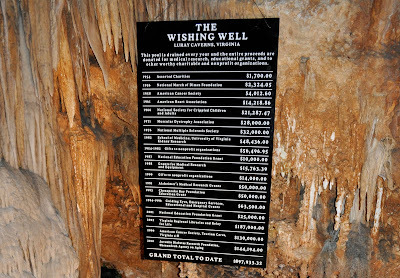 The sign explains that the wishing well is drained annually and the proceeds are given to charity. It also lists particularly lucrative year totals. Pretty good view for a cold, gray Saturday in December. I have exactly ZERO tolerance for caves, but I think I could handle these babies. Needless to say, I was initially leery about looking at your pics because of the title. Those crazy people who wriggle through tiny caves for sport are beyond my comprehension (and stomach; literally makes me ill). Oh Luray. I took Christian on a date there. Did you love the organ? We really wanted to check that cave out at some point. I never would have thought to go in winter though. Great idea! thanks for posting this. You got some awesome photos. I LOVE Luray Caverns. I love the picture you took of the delicate folds in the rocks overhead. I have been to Luray Caverns a lot and never noticed rocks like that. Great picture. Oh, all your posts are making me so nostalgic! I am amazed at how much you information you gleaned from your tour, versus me from mine, but not suprised. : ) I'm so envious that you got to hear the demonstration of the organ. I love the beauty and intricacies of nature. Santa Claus is Coming in 3 Days!